What are the Bird Types? This free-to-play puzzle game that features stylised wingless birds of differemt shapes and sizes involves players using a slingshot to launch them at pigs that are sheltered around structures made of various materials such as wood, glass, and stone. The goal of the player is to eliminate all the pigs and complete the level with 3 stars, when a level has been successfully completed the next level is unlocked. If a player fails the level by either running out of time or birds to kill all the pigs they will be forced to play it again. As players advance through the different levels new types of birds will become available which will have certain abilities which players can use to take advantage of acccordingly. With more features and attactive graphics, a lot of improvements, Angry Birds Evolution of mobile game is noticing at this point. Recently, a new version has just released Angry Birds Evolution continues to be a more ambitious of Rovio, when it has the difference, novelty and have the upgrade more pronounced compared to previous versions. Still with his bird control destroy hordes of green pig Cupid specializes in stealing eggs and still control gameplay with marbles of targeted hits, destroy the enemy's Lair. But also this version has many more points. How do you Unlock the Locked Worlds Without Playing the Game? Where do you Find the Golden Eggs? Which is the Most Powerful Angry Bird? What are the Toughest Levels? 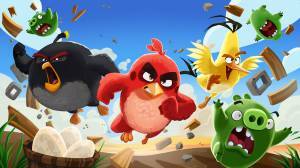 6Which would be best if had an angry birds?